Organised by the Norwegian British Chamber of Commerce, this event will bring together Norwegian, British and International Businesses for an afternoon of presentations aimed at individuals and companies based in Norway who are looking to potentially expand or relocate to the UK and who welcome the chance to meet with established UK based individuals and companies who can assist with advice, support and expertise. The event will finish with high-level networking where attendees will be able to mingle and meet with individuals from institutions and companies who can help you get started on your way towards a UK business expansion. Interested in exhibiting? 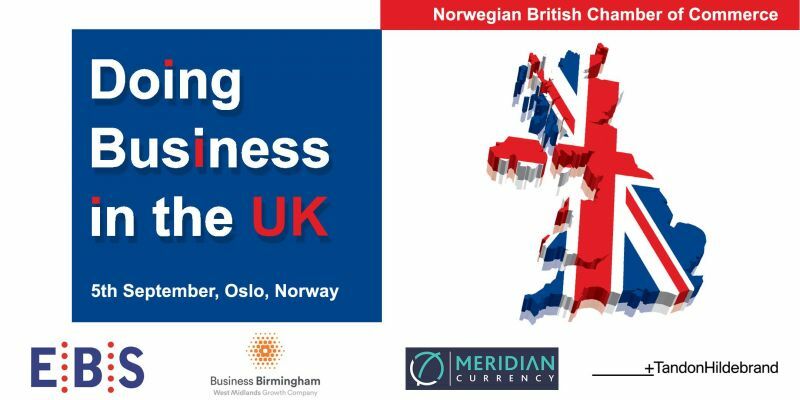 Please contact the Norwegian British Chamber of Commerce on event@nbccuk.com. Limited spaces remain.